Sober Homes in the Southend? Town Hall Meeting This Wednesday. 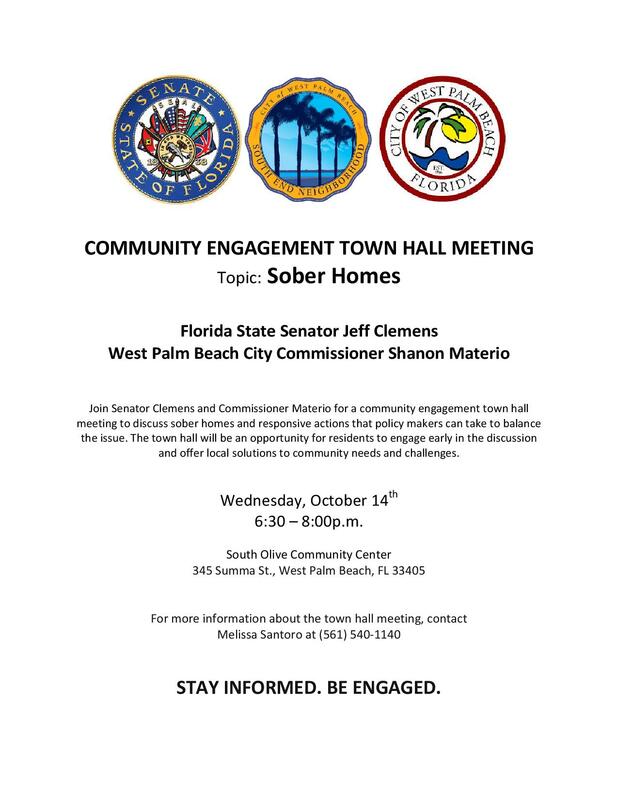 This Wednesday, October 14, there will be a community engagement town hall meeting to discuss sober homes and responsive actions that policy makers can take to balance the issue. The town hall will be an opportunity for residents to engage early in the discussion and offer local solutions to community needs and challenges. What’s the skinny on this issue? Many towns and cities have attempted to regulate sober homes, but have found themselves restricted by the Americans with Disabilities Act (ADA) as well as federal fair housing laws. Sober homes, or halfway houses, are not regulated by the state since they do not provide treatment. And because alcoholism and addiction are recognized mental disorders, people who suffer from these conditions are protected under the ADA. In February 2015, Rep. Lois Frankel, D-West Palm Beach, told a group of mayors and other municipal officials from her district that she had asked Housing and Urban Development Sec. Julian Castro and officials in the Justice Department about ways to help local governments regulate sober houses without violating federal law. In June 2015, Governor Scott signed the “Sober Home Bill” into law. This bill establishes a voluntary certification program for recovery residences and recovery residence administrators. It prohibits licensed substance abuse treatment providers from referring patients to recovery residences which are not certified or not owned and operated by a licensed substance abuse treatment provider. This is an issue that can impact our local community. Learn where the government officials stand and voice your opinion this Wednesday.